Not a lot is known, up close and personal, in Australia about the Religious Society of Friends (Quakers) in Australia. The main cause of this is that there aren't many of them/us. About 3000 people identified as Quakers at the last census. This came as a bit of surprise - because the most knowledgable Friends (as Quakers prefer to be called), as well as the records of Friends, could only account for somewhat over 1,000. For those who know about Quakers, there is usually one stand-out factor - they are pacifists and active campaigners for peace. 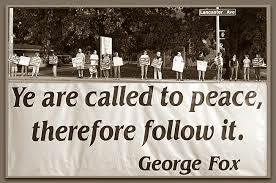 Please go here to learn more of The Quaker Peace Testimony. Quakers also keenly maintain their history with women in many places taking to needle and thread in preservation of the Quaker story. The Editor of The Network can testify personally to the needlework and design skills of Tessa. The event to which Helen refers is the Shoalwater Bay Peace Convergence 2015 which coincides with and is a protest against Exercise Talisman Saber 2015.